Virginia Plain – Worth a try, but Cumulus is right next door! | 15,000kms of Food! Virginia Plain – Worth a try, but Cumulus is right next door! Paid a visit to Virginia Plain about a month ago as we had heard really good things about the food, especially the steak tartare. The thing about Virginia Plain, is that it’s right next to Cumulus Inc., which made me constantly compare the two. Both have similar menus and similar price points. The only difference is that you don’t have to queue up for Virginia. So, question is, how good is the food? 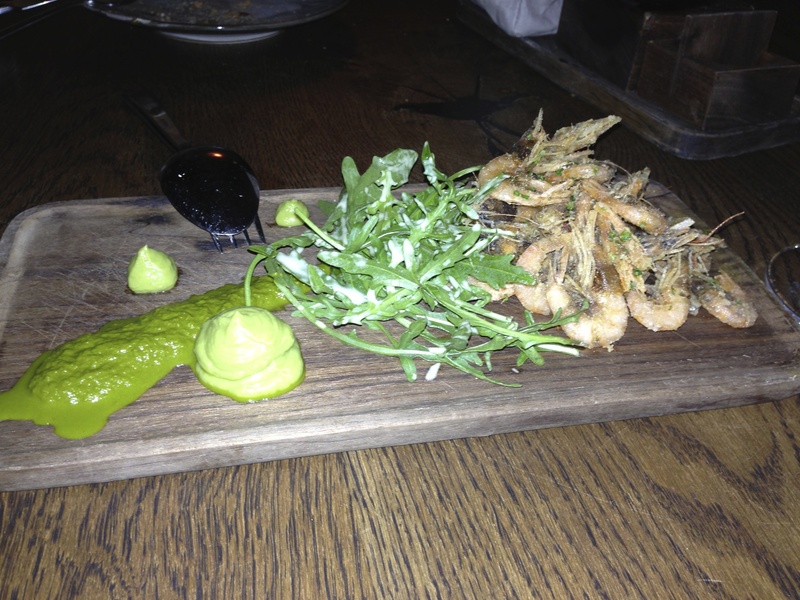 Started with a dish of crispy fried school prawns, which was a generous serve of prawns with sauce and veges. 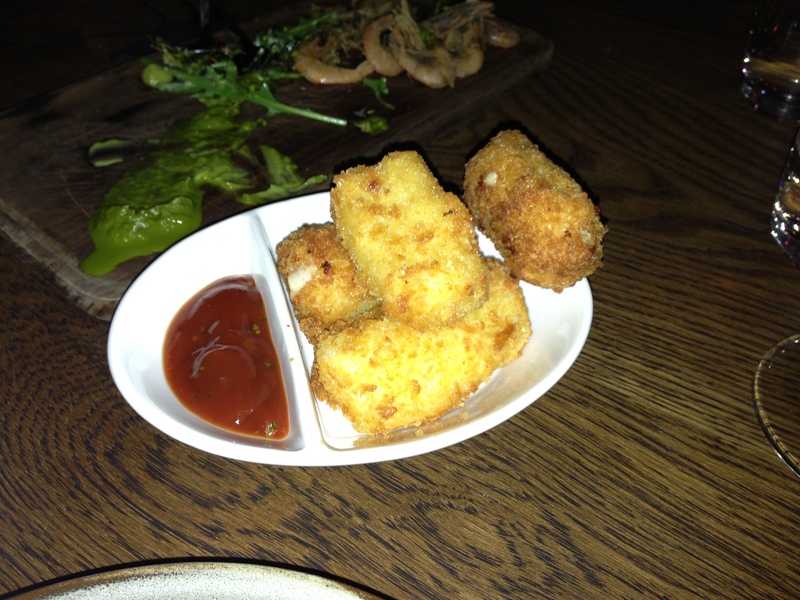 We then had a serve of cheesy croquettes, which were good fluffy potato morsels with a golden brown crusty shell. 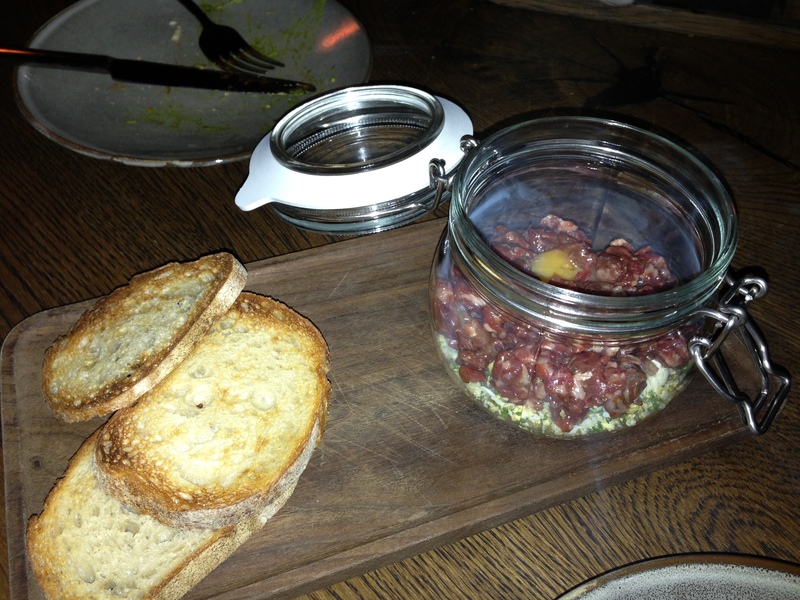 Then was the anticipated smoked steak tartare, topped with a quail egg yolk. Winner of a dish. The steak had a lovely smoky fragrance, and was mixed in a jar with sauce, gherkins and herbs. When combined with the crusty bread, it was divine! 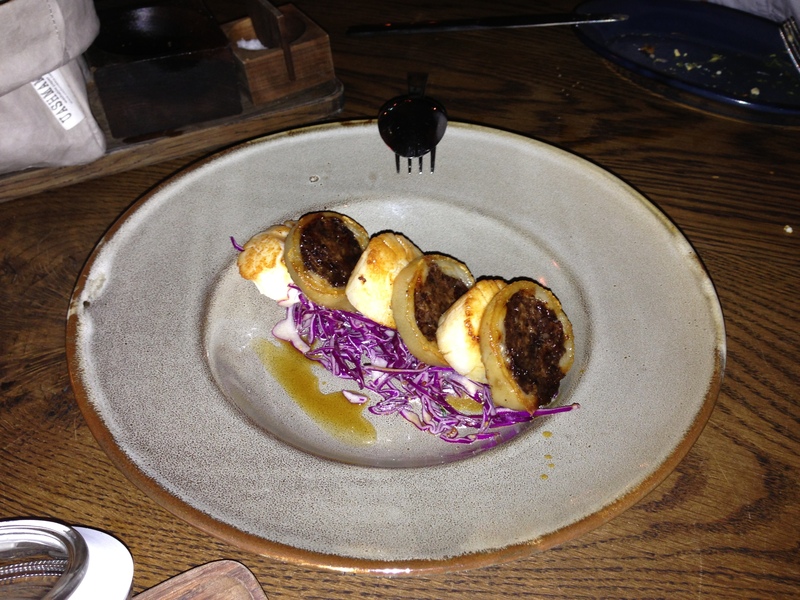 Next up was an interesting combo – calamari stuffed with black pudding. Tasted good and texture was different (but in a good way). 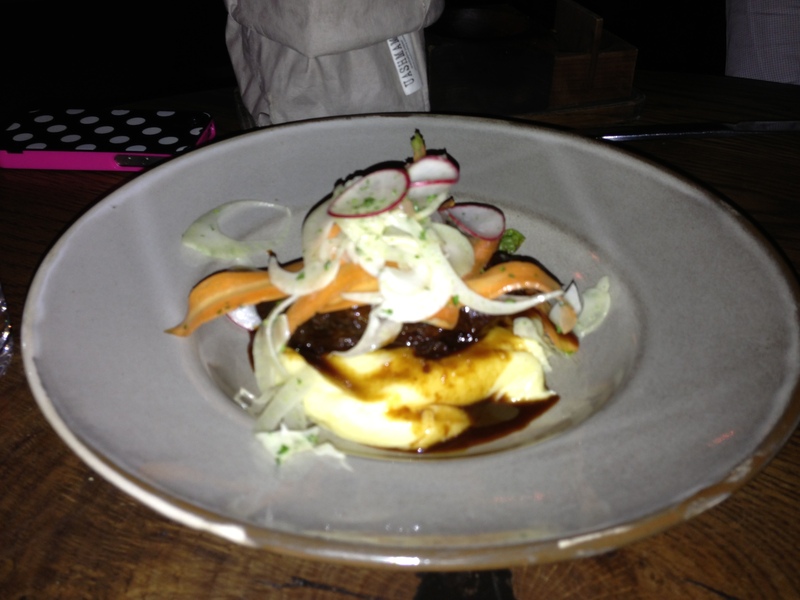 The beef cheek on potato puree was a great dish – tender tasty saucy beef cheek on top of smooth potato puree. 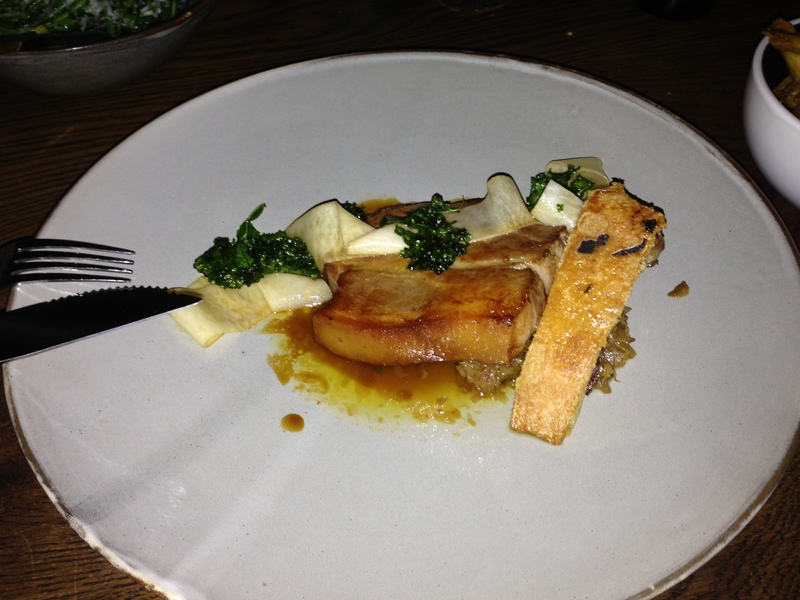 Lastly we had pork cutlet, kale & honey turnip – good dish with well cooked pork (and crackling on the side) with crispy cale and sweet turnips. So, overall, the food was good. Some items were very close (and comparable) to Cumulus, but some were different in their own right (e.g. : calamari and black pudding!?). The atmosphere was lively, albeit a bit dark (I felt like at any moment the place was going to be transformed into a nightclub!). Would I visit again? Only if I couldn’t get a table (or wait!) at Cumulus.